You may feel alone but as you start asking around among your runner friends, you'll find that this problem is all too common. And it's not just found among runners. Dr. Scholl (yes, the guy whose name you see in all the drugstores) referred to the condition in a book he wrote in 1915 as "Policeman's Heel". Plantar Fasciitis was the injury that ended the career of Joltin' Joe DiMaggio of the New York Yankees. It's also been the bane of superstar 1st baseman Albert Pujols of the St. Louis Cardinals, arguably one of the best players in the game today. So you're not a sports superstar or even a runner and you think you're off the hook. Think again. Plantar Fasciitis is an equal opportunity afflicter affecting everyday people as well. By some estimates 10% of the population has had it and there are an estimated 7 million new cases each year. It’s the number one reason someone goes to the foot doctor, accounting for an estimated 46% of all office visits. Incorrect Footwear - This includes summertime favorites such as dollar-store flip-flops or going barefoot. Not that they will always cause the injury but they certainly will accelerate it. Shoes that flex in the arch as opposed to closer to the toes will put extra stress on this Plantar Fascia. Your local Running Specialty Retailer can help you select the right running or walking shoes for you, or help you find sandals with appropriate support. Over-pronation - A little pronation is a good thing but too much of a good thing is rarely good. Pronation is the twisting or rolling your foot undergoes from the time your foot touches the ground until the time it leaves the ground. Generally, in ideal cases, it's about 15 degrees. Its function is to absorb shock and position the foot to allow you to push off of your toes. Think of it like twisting a hand towel to wring it out. As you twist it more, it becomes tighter. 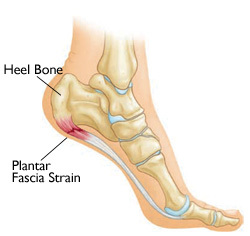 Sometimes it can become too tight and can cause the fascia to tear away from the heel. This over-pronation can be modified through use of an appropriate running shoe selection or an insert, such as Superfeet. Sudden Increases in Activity - Like the new runner mentioned above too much too soon is also never good. Find a training group at a local running store to guide you through the process of increasing your activity at a rate your body can handle. Sudden Weight Gain - A little too much turkey after the turkey trot followed by Christmas cookies and a winter wonderland of slippery streets are not always conducive to running and can help add a few pounds. Pregnancy also often comes with some rapid weight gain as well as a hormone called Relaxin which can make joints more unstable. How Fleet Feet Sports Can Help You! Are you in the right shoe? Being fit for a proper running/walking shoe can correct over-pronation and can prevent plantar fasciitis. If your plantar fasciitis is caused by excessive pronation, we suggest a stability or motion control shoe. Do you wear an orthotic insert? If not, we suggest you try the Superfeet inserts. Superfeet inserts provide stability to the heel in the shoe, improving balance and biomechanical alignment. The insert also provides support to the fascia tendon in the shoe by not allowing it to over extend and cause undo strain on the tendon. Do your dress shoes offer any support? If not, Superfeet also makes a 3/4 length insert that slides easily into men's and women's flats and women's high heels. By providing a heel cup and arch support, the Superfeet dress insert can relieve pain throughout the day. Stretching for tight calf muscles. Plantar Fasciitis can also be caused by hyper tension in the calf. By relieving the tension in the calf muscle, we can alleviate the pulling on the fascia. Products such as Trigger Point, The Stick, and Trigger Point can help relieve tension throughout the body, especially the calf. Icing the tendon can also provide short term relief by reducing inflammation. Strassburg Sock...when we sleep, the fascia tendon attempts to heal itself in an unstretched, relaxed position; however throughout the day the fascia is being stretched and pulled through the course of normal movement. When we step out of bed each morning, the healing that has occurred over night is immediately undone. By utilizing the Strassburg Sock to keep the fascia engaged throughout the night, we help speed along the healing process.